< Previous The Kitchen Project. oohhhh, da itty iggies are soooooo ute! ay, an ag alm o anyting aout my allergies? ave o ut ag alm n my nex hopping lisd. At les my skin won’t be as ry. anks for he ood avice! othing to oose! our o ery elcome aby! S: on’t orget he ansinoh fter aby s orn – ike utter or oobies ‘ells a! BTW: You should’a punked out the pigs fur whilst they were greased up. Hmmm… greased pigs! Hah! But seriously, the whole “greasing experience” was equally unpleasant for all involved. Bag Balm is wondrous stuff but truly the thickest glop on the face of the planet. I have stains all over the pants I was wearing that day, which will likely never come out. Fortunately as most of my wardrobe has paint or holes anyway, who’ll notice a few enormous grease stains? The poor greased piggies were miserable/ but they’re super happy now! Long live Bag Balm!! Can I use it without revolution? 🙂 I just found out that my guinea pig i recently purchased from petsmart has mites and scabs and hair falling out, POOR BABY! I didnt wanna deal with it because I just got him and cant afford the vet right now. Since i didnt wanna deal with it i wanted to give him back, i thought, oh they wont notice since they didnt even know he had mites! But i noticed today was the last day to give him back , i had a 14 day guarantee. And i got really pissed of because in the paper they said they had a freaking DISEASE HAZARD . I was wondering if i could use the bag balm without revolution? You’ll thank me when your bags need balming! as for those little fury tribbles…gee, they are pretty big. they look like rabbits without the ears. what are their names? 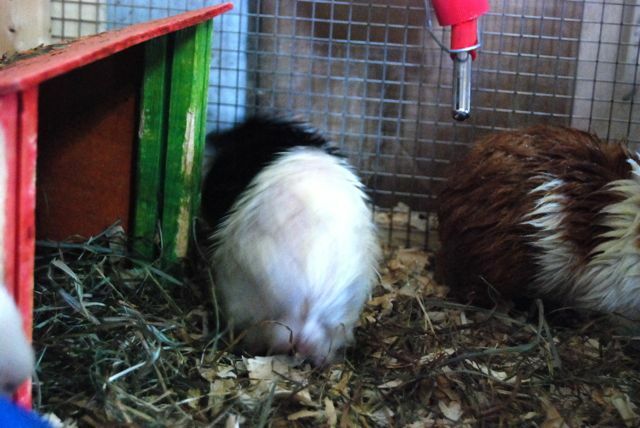 The guinea pigs are young but biggish already. I think they are seriously adorable. The two new guys have sort of a “possum” look to them. WHich might normally freak me out but now I find endearing. Their names are Oreo, Snowflake, Caramel Cream and Butterscotch II. PS: I want a bunny. I keep checking craigslist. OH YES. 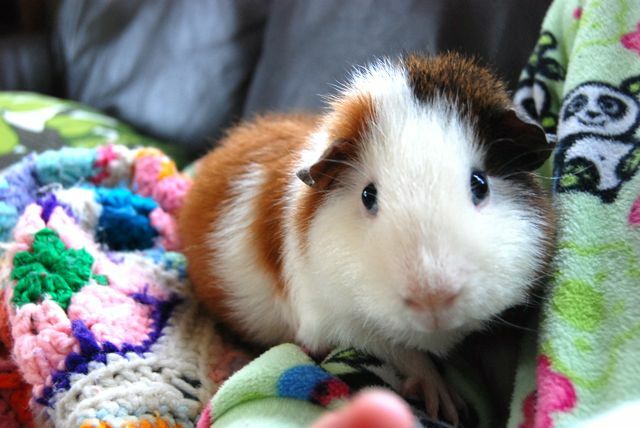 We had a guinea pig once and he was so spastic we named him Kramer after Cosmo Kramer on Seinfeld. If his food bowl was empty he would tear off a strip of newspaper and put it in his dish. It was often a food word. Sorta like Charlotte’s Web! Too funny! Our guinea pigs certainly like to eat. With 4 of them, we go through bags of timothy hay and pellets – at least a bag each, each week. And BOY do they let us know when they want more. Squealing & wheeeeeting like crazy! They bang their water bottles, shake the food dispenser. None too subtle these guys..
Oh Wow…I have some that I use on my feet…time to start slathering it on for sandal season! let’s see Wild Turkeys, dog, 4 “piggies” one interesting bird…am I missing any one? We also have two Russian dwarf hamsters, Hammy (the 2nd) and Pom-Pom. They’re unbelievably cute & so sweet. Love them! Oh, see I knew I wasn’t hallucinating when I thought I saw more than 4 piles of adorable! Your little piggys are so cute. Poor things getting the mites though, it must have been horribly unpleasant for them. Good thing the bag balm relieved them of it. 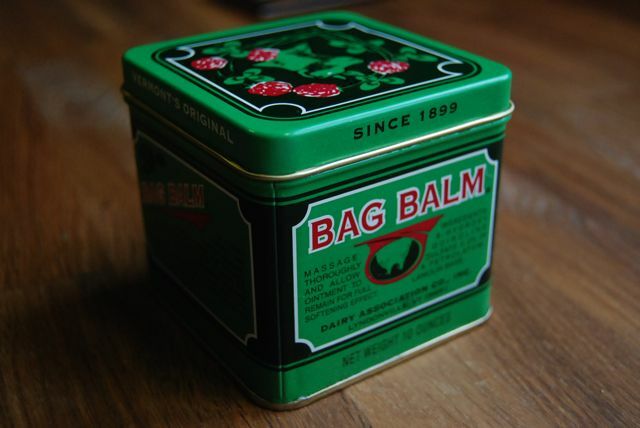 Growing up on the farm, Bag Balm was a staple at every household I knew, but I’d totally forgotten about it, and now I’m going to have to buy some for my poor boyfriend whose pinky finger has cracked for some reason but who refuses to put on lotion more than twice a day. Genius! Also, your little piggies are adorable! Even greasy! HEYYA UM!! That is so funny – did you see the new Alice in Wonderland? Alice is called UM too! As for the BB, try Walgreen’s – I found it there in Philly. Make sure he uses it at night.. I put some on during the day recently, and when I went to the paint store to look at sample cards it left little greasy fingerprints ALL OVER. Whooopsie. Thanks Tony! PS: Like your new pic! new post please. 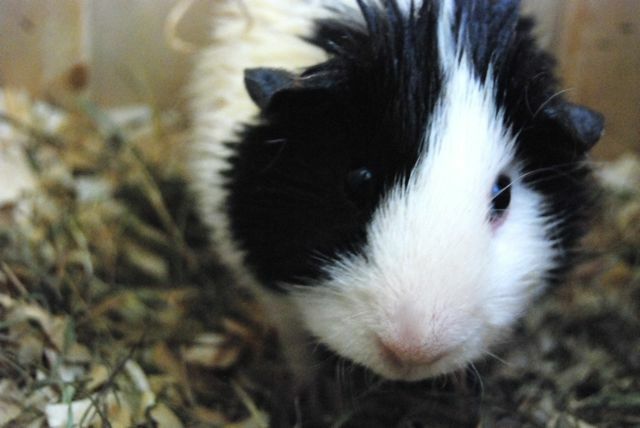 how about pictures of the newest addition to your rodent family? i’m off to the museum of natural history today with jess and my nephew. should be a hoot. tomorrow it’s the BOARDWALK. the girl looks great and i look like 10 miles of bad road. someone save me. 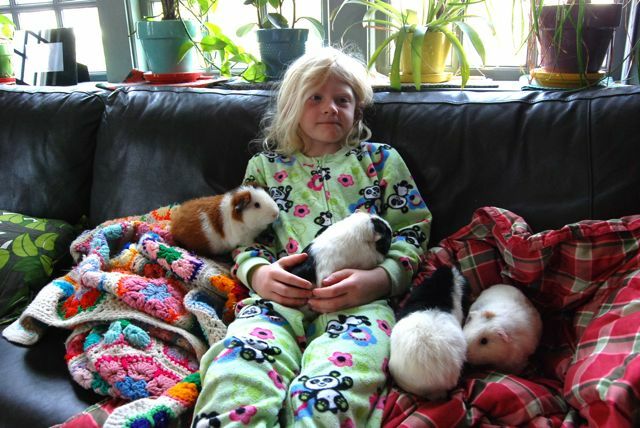 What a great picture of happy child and happy piggies. If you can’t find BB in the UK, def contact the company – the link’s there above. I’m sure they can help you, and it’s marvelous stuff. The guinia pigs look very strange covered in bag balm. HI! I am hoping someone replys to this soon~via email will be nice as I will probably not be able to find this site again. I have to piggies that I love dearly…When I brought my second piggie home and introduced her to my first guinea pig (pepper ann) we were super happy….until about a month went by and we realized a change in their behavior..well come to find out they had guinea pig lice…so I immediately took them to the vet. She gave them each a dose of oral ivermectin and said to come back in ten days for the second dose in which i did…it seemed to clear up the lice I have yet to see anymore. However now they are itchy and losing fur…..so I am pretty sure they have mites. I cant afford to take them to the vet so i started doing some digging online and found to use bag balm…so I coated my piggies head to toe..they seemed to not mind and maybe it alleviated some of the itching. My concern is that they are eating it off of each other…is this ok? Also will this help them and how long do i leave it on them? If i have to wash it how…how and I going to do that?? 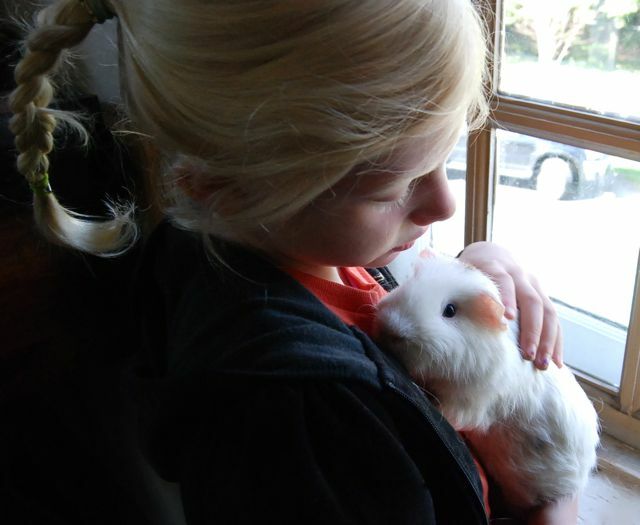 Please help I want my piggies better…I cant even pet them anymore because it seems to hurt them! I did this to my guinea pig today. He seems kind of sluggish now, is this normal? Hi, can bag balm be used on pregnant guinea pig? Really need your help guys. And if i cant fure her, if she succeed in giving birth can the babies be feed and with what please? What type of milk? Thx a lot for the response! Oups i miss a c, if i can’t cure her, not fure her…on my previous comment. 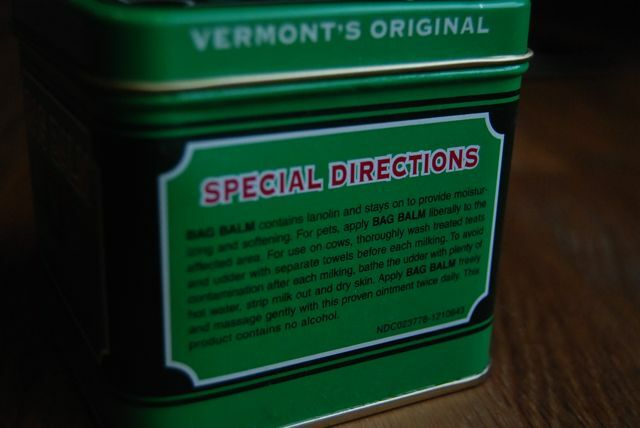 to the poster that asked if she could use the bag balm without the revolution – yes. you might have to apply it a couple of times though.